Thank you for writing. 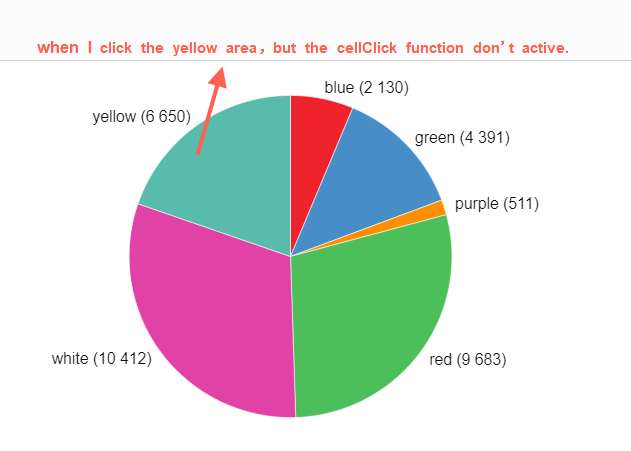 The cellclick event is only applicable for the grid cells. It is not triggered when you click on the chart area. Currently, the component does not provide the similar API for the charts. Could you please provide more details about your use case? It would be much easier for us to find a suitable solution for you. There is a possible alternative approach which lies in customizing the context menu. For example, you can add a custom item to the context menu with the functionality you need. Inside the customizeContextMenu function, you will get the object which contains information about the chart segment which was right-clicked. For more details please refer to the documentation. There is a small known issue with the information returned by Chart Object, however, it will be fixed on August the 25th. Please let me know if the approach described above can work for you.